If you spend time in Budapest there's a nice wine bar to feel the pulse of the wine scene of the region, this is the Drop Shop wine bar. This venue, which is conveniently located at 27 Balassi Bálint utca near Margit híd [bridge], tramway lines 4 & 6 (Jászai Mari tér stop), is at the same time a wine shop and a wine bar with a large portfolio including French wines. But you certainly won't come here to drink some Dagueneau, Domaine Dujac or Zind-Humbrecht although they stock these wines, but rather for their equally-brilliant selection of artisan wines from central Europe including Hungary and Austria. Drop Shop is certainly the place to visit for wines-by-the-glass (they have 50 of them ! ); you'll find many wine bars in Budapest today but like elsewhere including Paris this fashionable concept includes venues where you pay more for the hype than for what's in the glass. Speaking of "what's in the wine", Drop Shop has a very interesting page on its website (I wish all wine bars in the world could educate their customers this way) where wine amateurs are introduced (in English & in Hungarian) with a short list of the odd additives that most commercial wineries add discreetly during the making of their wines. This wine bar is open monday thru sunday [yes, everyday, we're in Budapest, not in Paris !] from 11am to midnight (and I guess later if. If you read Hungarian (otherwise use Google Translate) there's an Interview of Adam Hebenstreit, the owner of Drop Shop on Gault & Millau Hungary, he speaks about the recent developments and trends in the wine trade, and asked about what come ahead, he says biodynamic viticulture and natural winemaking spreads, even if this is not bragged about on the labels. And Hungarians begin to discover their own little-known wine regions like Bükk, Tolna and Kőszeg. I owe this visit to Bálint and his wife, they were living in Budapest before starting their domaine in the Matra hills, and they know very well the wine scene here. The wine-by-the-glass list is impressively long with 50 still wines (49 exactly) and 9 sparklings (including Champagne), and even if your not entirely familiar with the top Hungarian domaines, you'll notice a few names known for their artisan work and excellency : István Szepsy, Bott, Bencze, Gizella, good omen for the rest. 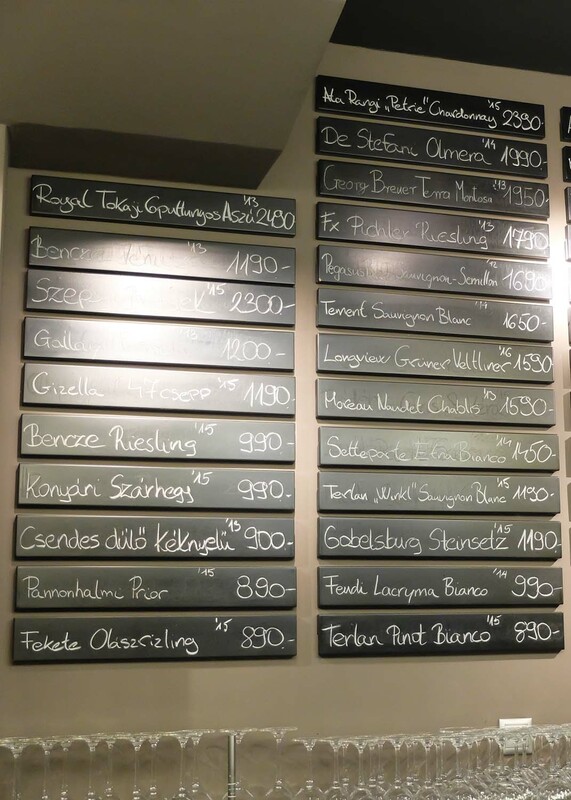 Regarding the prices, most of the glasses cost between, say, 900 Forints (2,9 € or 3,1 USD) and 1500 Forints (4,8 € or 5,2 USD), which is pretty affordable when you deal with quality wines. The glasses for Champagne cost from around 3000 HUF to 4000 HUF (9,7 € to 13 €). 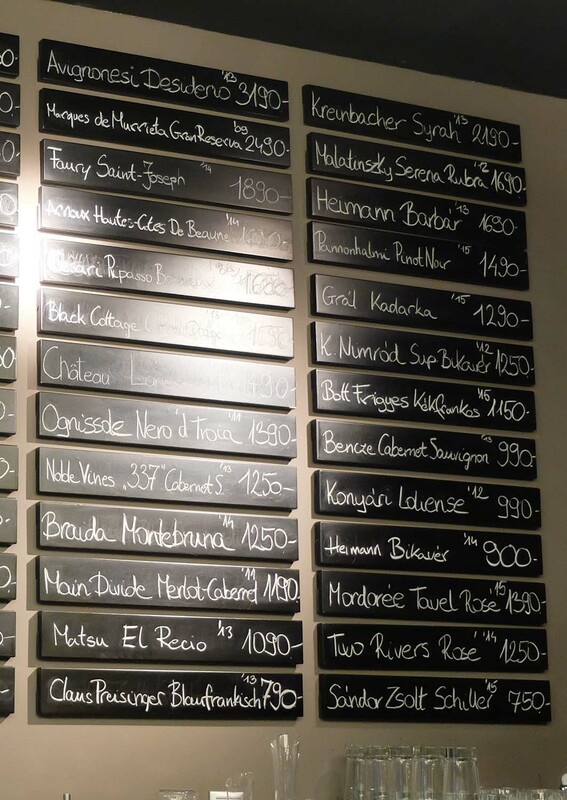 Considering 1000 HUF make 3,22 € or 3,46 USD, you can check by yourself the wine-by-the-glass selection & the prices on these closeup pictures, part one and part two. That was of course when we went there, wines are changing regularly. A few excerpts : István Szepsy Betsek Furmint 2015 2300 Forints; Gizella 47 Csepp Harslevelu 2015 1190 Forints; Bencze Riesling 20115 990 Forints; Sándor Zsolt (from the small Bükk region) Schiller 2015 750 Forints, lots of artisan wine made from organic vineyards. You can have bistro food to go with the wines, like charcuterie and cheese. __ Bencze Rajnai Riesling 2015, our first glass at Drop Shop, the domaine Bencze Családi Birtok started in 2011 with 30 ares, it is located near lake Balaton, is organic from the start and now farms 20 hectares. Natural vinification on wild yeast. the domaine is also exploring the ancient varieties of Hungary and he's been making traditional sparkling (Champagne method). Balint says the dommaine is one of the very promizing new domaines of the Balaton region, it's now doing Biodynamics in the vineyard. This is sort of the basic Riesling cuvée, they have a selection Riesling they aged in large barrels and they now do it in amphoras. This one had partly some élevage in casks. Very sunny on the nose, B. says. In the mouth I find the wine delicate, well balanced and light, an aerial and subtle Riesling. the back label says that SO2 is under 67mg/liter. __ Gizella 47 Csepp 2015, we're told that this cuvée was vinified by the wine bar team, and they did the picking here as well, the pressing, everything. This has become a tradition every year, the staff go there a couple of says and makes this cuvée, which you'll find only at the wine bar. Gizella which is managed by Laszlo Szilagyi is a fairly new winery (even though the owner has his ancestry in the wine trade) which is today working from a 12-hectare surface, and it is also considered among the best domaines in the Tokaj region. Very nice mouth feel along the palate and throat, I like the noticeable silk-paper white-tannins feel, and the enjoyable acidity that wraps the whole experience. Winery profile with pictures by Andras Lovacs (in Hungarian). __ Sándor Zsolt Schiller Zweigelt 2015, here is a wine made in this little-known wine region of Bükk, which was in the past much more widespead and is now rising again under the spotlight thanks in particular to the work of this borász (vigneron). Actually there are today only 5 hectares of vineyards doing estate bottlings in the Bükk region, farmed by two growers (Sándor Zsolt and another guy), and hopefully with Hungarians getting more and more interested in their viticulture Heritage there should be more winegrowers in the future setting shop in the region. The soil is similar to the one in Tokaj with Ryolits and it's closer to Budapest which could encourage outsiders to start something. this is some kind of claret for the color, not a rosé really but a very light-colored red rather. Made from Zweigelt grapes, from the vineyards in Zúgó-dűlő and Mályi. One day maceration, fermentation on indigenous yeast (from his website you understand that the grower/winemaker is commited to natural and non-interventionist vinification. 13 % alcohol but feels much less, nice intensity in the mouth and throat, with a candy style of aroma. Easydrinking in spiter of these 13 % on the label. The empty glass radiated very nice aromas... Balint says that this is the type and style of wine which Hungarians drank for centuries, they'd make it from Kadarka, just that in the past centuries the maceration would last a few days more, but people would drink a light wine of this style as the water was not very safe and was often contaminated, this would be the common beverage. A bottle costs 3800 Forints (12 €) to go. __ Grál pince Kadarka 2015. Now here is what is possibly the best Kadarka of Hungary, it's made by Grál pince [pince means cellar, which has the meaning of domaine in French] which from what I understand has a surface of 3,5 hectares and is located in northwest of Szekszárd in a Swabian (German ethnic) area. 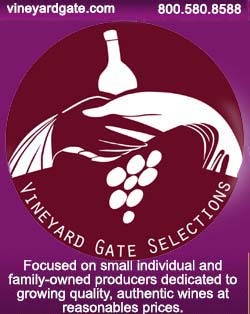 The wine is made from two different types of Kadarka farmed without herbicide or other chemicals, natural winemaking in open-top barrel with indigenous yeast. Spent a bit less than a year in Hungarian oak (a single barrel made from this). Not on the market right now, outside from here (only at the wine-bar side). The winery started with 2 hectares and now totals 3 or 4, very small production overall. From what I understand this wine is made from an ancient version of Kadarka, with bunches having looser berries and smaller berries as well, it's the first vintage made with this ancient-Kadarka sub-variety (the parcel is 3 years old maybe). Mainstream Kadarka grapes, the ones found everywhere else today, are very different and don't render what Kadarka was in the past, because the clones used today are so different [I guess they were selected for bunch size and higher yields]. Balint says he did a wood selection of this ancient Kadarka 2 years ago with József Szentesi and at the time this was a very bad vintage with lots of rain, and you could see how different the "modern" Kadarka and the ancient one behaved under these circumstances, the modern clones were in pretty bad shape while the ancient sub-variety with its smaller bunches and loose grapes were healthy. The smaller berries translated in more concentrated flavors, and he is thrilled by the quality of the wine from this ancient version of Kadarka. Balint says that the problem with the generic Kadarka clones found everywhere today is that not only it tends to ror easily but also the grapes in a given bunch don't ripe together, you'll find in the same bunch well-ripen berries and green berries and the differenr stages in-between, which means that to make a good wine you should sort the grapes throughout each bunch for the whole parcel, which is virtually impossible, especially for mainstream wineries. They had just a few bottles left at Drop Shop and you may have to wait to get one (hopefully they'll have more of it next year), but don't miss it and watch this guy, great Kadarka indeed. So delicate, like a great Pinot Noir with complexity and intricate flower aromas. The mouth is not that long but it has an exciting life feel and silk-paper tannins. A bottle sells for 6500 Forints (21 €) at the bar and a glass costs 1290 Forints (barely more than 4 €). __ Bott Frigyes Kekfrankos (Blaufrankisch) 2015. Bott Frigyes is a domaine located in neighboring Slovakia in the Južnoslovenská vinohradnícka oblasť, an area that was Hungarian before the Austro-Hungarian empire was dismantled in 1920. The village of Komarno right on the other side of the Danube (which is today the borderline with Hungary) is culturally Hungarian and retained connection with the former motherland. local The domaine is partly organic, we're told by Balint. Balint says by the way that in this part of Slovakia there's another interesting winemaker, doing very audacious experiments like Jura-style veil wines, and using very low sulfites (couldn't understand his name though). This Kekfrankos is a serious red, intense all the while with lightness in alcohol feel. Gastronomy wine, the tannins are noticeable but nothing harsh here, it's rather round. Not bad, and very good acidity level. Read (or Google-translate) here a tasting report (in Hungarian) by Andras Kovacs. __ Bencze István (Bencze pince) Cabernet Sauvignon 2013. the domaine Bencze farms 20 hectares in the Lake Balaton area (north side) and shows again that it stands out in the Hungarian wine scene : Now, this is a superb Cabernet Sauvignon, no question, the wine which has an evolved color is very elegant and classy with refined, integrated tannins. Such a lasting pleasure to drink... Balint says that this is certainly the most harmonious Cabernet Sauvignon you'll find in Hungary. The Villány wine region for example has lots of Cabernet Sauvignon but the mainstream wineries there have followed the international style, this was maybe fashionable 20 years ago but he doesn't like them, they're oaky with unripe tannins and harshness. The winery webpage for the 2013 wines says the grapes were destemmed and fermented in large-capacity oak barrels for 3 weeks, with an additional year of élevage in wood (it's not clear if the press juice was added or only partly added) and with further aging in bottles. Total SO2 is 40 mg/liter and acidity 5 grams/liter. That's certainly a very good pick to make if you happen to see this bottle in a wine shop. Special thanks also to Richárd Póta (pictured on right), the sommelier at Drop Shop for his explainations and advice. Hungary wine is awesome - specially the one from Balaton! "Balint says by the way that in this part of Slovakia there's another interesting winemaker, doing very audacious experiments like Jura-style veil wines, and using very low sulfites (couldn't understand his name though)." Thanks to you z23 for this tip on Zsolt Sütő, I'll sure try to visit him !